While astronomy and space are Dave's main interest today he reminded me that he still feels strongly about the UFO subject, reflecting a statement that I often make, that UFOs deserve better scientific strutiny that they have got to date. He understands that mainstream astronomy rejects the UFO subject, but feels that this has come from limited exposure to the depth of the UFO subject, and too much exposure to the superficial commercialisation of the subject and the lunatic fringe aspects of the controversy. Each of these cases are described in my 1996 book "The OZ Files - the Australian UFO Story"
I have included two contrasting pictures of Dave and myself. 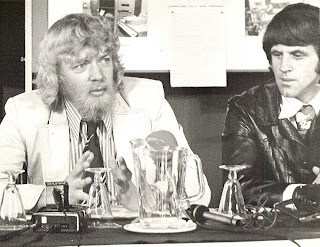 One from an early 1978 UFOIC (aka UFOR(NSW)) press conference in which we were highlighting that even before the massive breakout of UFO fever that occurred with the extraordinary disappearance of pilot Frederick Valentich over Bass Strait during a UFO encounter in October 1978, we already saw 1978 as a "Year of the UFO". 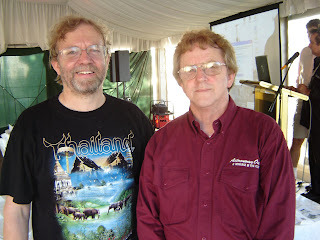 The other photo of us was from 2007 at the Sydney Observatory where Dave gave a spirited defence of the "planet" Pluto in the Great Pluto Debate - a fun night, which included some comet watching as well. 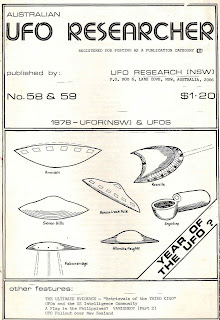 I also have included reproductions of the UFOIC group's publication the "Australian UFO Researcher" which evolved from the UFOIC Newsletter - The "Year of the UFO?" 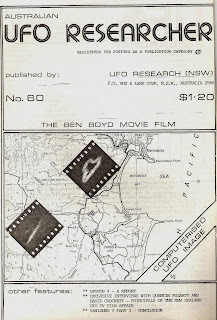 cover shows some of the UFOs examined by UFOIC (aka UFOR(NSW)) during that incredible year, and the Ben Boyd movie film issue.